We’ve heard of tech companiesusing Social Media in multiple ways for their business benefits. However very few companies have used the medium to identify and recruit potential employees, apart from using the same for background checks. The maximum we’ve seen is an exclusive Facebook tab or a Facebook page for careers, where monotonous job openings are being posted with a couple of feeds around the company’s work culture. Breaking all the silos being followed by tech biggies in the country, HCL Tech, India’s 4th largest software services firm has taken a revolutionary step in using ‘Twitter’ as a medium to find new talents for the company. 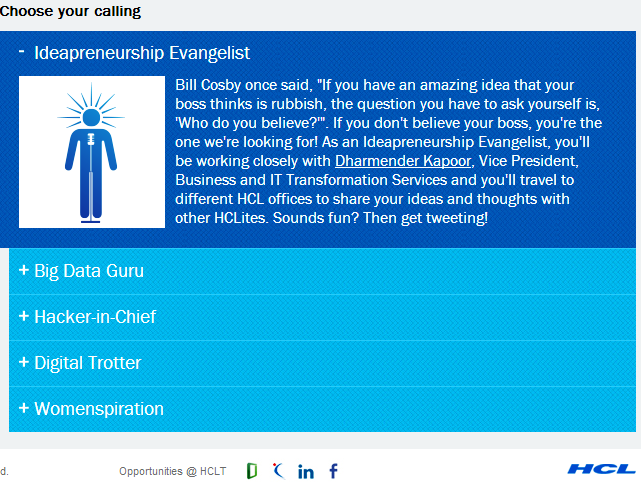 The objective of the campaign #CoolestInterviewEver is to shortlist candidates for ‘The coolest project ever’ under five categories – Ideapreneurship Evangelist, Big Data Guru, Hacker-in-chief, Digital Trotter & Womenspiration. The job descriptions of these profiles are available in the link here. The winners are not only going to be treated with a dream career but also with a whopping prize money of upto USD75000. The campaign uses Twitter as a primary medium for interacting with the users and with other channels like Facebook, YouTube, LinkedIn and an exclusive landing page named after the campaign to drive traffic & awareness. 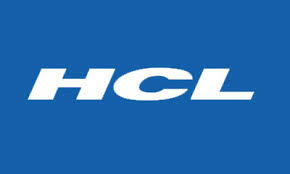 The users are advised to follow @HCLTech on Twitter. The campaign started on Feb 10, announcing that there will be a question every 2.5 hours and users will be shortlisted based on their answers. HCL calls this the ‘Marathon shortlisting process’ and the user can answer the l last consecutive questions at any given point of time to take a shot at the shortlisting process (Making it fair for those who came to know of the campaign at a later stage). Followed by the initial shortlisting round, there will be a ‘TweetChat’ with HCL Tech’s HR Department for those who cleared Round One, where they get to ask questions about their project at HCL Tech. Let’s explore the ways in which the HCL Tech created buzz around the campaign and generated outstanding response. The YouTube video created for the campaign has fetched over 26,000 views in a month. Thanks to Facebook, sponsored posts and a strong fan base, HCL Tech enjoys popularity across multiple social channels. The posts in social channels were interactive and were created in such a way so as to attract the young crowd (once again breaking the silos being followed by IT biggies by not following a standard color pattern created in accordance with traditional brand guidelines). The series of ‘4 Commandments’ posts conveys the rules to be followed by the candidate to participate in the campaign. Had I been a part of this campaign, I would’ve suggested the addition of a 5th commandment for users to update their Twitter profiles with a profile picture and a description. You can easily locate a lot of Twitter Profiles with ‘Egg DP’ and ‘No Description’ participating in the campaign to land their dream job and some of these have got the tweets with #CoolestInterviewEver. It could be because someone created a new Twitter handle, badly wanting the job or the usual practice being followed in the industry by a few folks who claim to have won awards, to execute a trending campaign #IfYouKnowWhatIMean. The Twitter Handle of HCLTech pretty much had the same kind of posts for the initial buzz but later on followed up with a series of questions (General aptitude – Making it a little easier for more users to participate in the campaign) as promised. Take a look at this beautifully compiled ‘Storify’ by Prashant Singh to understand the rules of #CoolestInterviewEver and the type of questions asked by @HCLTech on Twitter. The campaign has got its own negatives. The offer is lucrative and the prize money is definitely tempting for someone to participate but not all folks who are on jobs right now will be willing to participate in an interview on a public platform, as majority of the companies out there monitor the social profiles of their employees on a regular basis. Trust me, even few start-ups do this and you know what happens later, when they see an employee applying for a new job! Setting these things apart, this campaign certainly is one bold and brilliant attempt by HCL Technologies in positioning themselves as a trend-setter in social recruiting space. I can foresee many Indian companies who are open for innovation, adapting this practice in the near future.